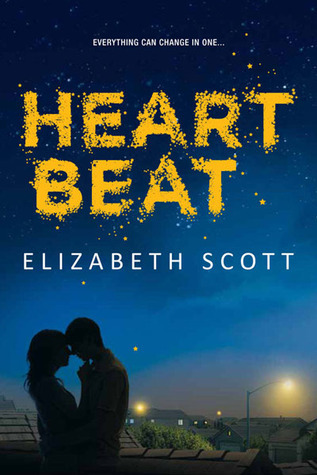 Elizabeth Scott delivers a very emotional, heavy dose with her latest young adult novel. Grief on its own is a tough pill to swallow, especially for Emma who refuses to accept the reality of what her world has become. One morning her pregnant mother was alive, reaching out for toast, and moments later she is dead. The decision to keep her mother's body alive on machines in order for the baby to continue to grow and have a chance at survival comes from Emma's stepfather. That decision is what spins Emma's world into a chaotic depression. She feels that she never had a say in what her mother's wishes were. But who honestly knows what her mother would have wanted when those who loved her most can't see past their own grief. There were elements in this novel that kept me on the fence through most of it, never quite allowing myself to fully be immersed in the world Elizabeth Scott was writing. I struggled a lot with Emma's character and the way she dealt with her grief. I've been through those stages, so I understand how difficult it can be to transition out of the anger and guilt phase. But I was also a few years older than her. The way she placed blame on her stepfather really tugged at my heart. I knew deep down she understood it wasn't truly his fault, but she had to come to terms with that in her own time. And so I waited, patiently. The idea that Emma went to her dead mother's bedside day after day, to witness the growth of her baby brother inside her mother's stomach, ripped my heart out. I cannot imagine having to endure a pain like that. The prolonging of such a difficult goodbye wears Emma down. But then she sees Caleb, a boy from school who has his own troubled past, still fighting his own personal demons. I knew immediately where this storyline was headed. I get that it's meant to show Emma that among grief, one can find hope again. And it's true, it can happen. But I felt that their relationship was a bit too over the top in parts. Overall this story delivers an emotional punch that fans of heavy YA contemporary will enjoy. For me, there were more negatives than positives that stood out, which didn't allow me to fully connect to the story as I had hoped to. Elizabeth Scott has a blacklist of superb novels, so I know this one will not stray me from reading her again. I felt very similar about this novel. I basically hated Emma, but I understood where she was coming from so I pitied her as well. Still, it was hard to read how she was treating her awesome stepfather who was dealing with his own grief. It felt very teenager-y to me - realistic,, but difficult when you're not a teengaer. Hm. You make some interesting points, my dear. This one scares me so because it is just SUCH a heavy subject and as new mom, I'm afraid of how emotionally freaked out I'm going to get about it. I agree with you though that even if this one doesn't work for all readers, Elizabeth Scott has written so many fantastic books that there are plenty of other ones out there to enjoy! To say that I'm apprehensive about reading this story would be an understatement. I've been waffling back and forth as to whether or not it's the right book for me since I first heard of it. On the one hand, I love contemporary novels, particularly when they deal with realistic topics like this one. On the other hand, the idea of using a woman as little more than a human incubator makes me a little sick and the negative reviews I've read have me more than a little wary. I did like that Anna mentioned a positive female friendship between Emma and her friend Olivia in this novel. That's something I always appreciate, and has given me something to look forward to. I actually won an ARC from Harlequin Teen today as one of Goodreads' 'First Reads' giveaways, so whether I like it or not, I know I'll be reading this in the not-so-distant future. As you mentioned in your review, I'm a little concerned about whether or not I'll be able to connect with Emma and how I respond to her treatment of her stepfather. I know this has been an issue for a number of other readers as well, but I'm trying my best to keep an open mind. Unfortunately, sometimes that's easier said than done, especially when I see bloggers whose opinions I trust, like you, have a difficult time with a particular book. I'm really curious about this one, as it's been garnering pretty mixed reactions from people. It should be an interesting contemporary read, however, because the subject matter is very unique (well, at least to me). I'm sorry to hear that you weren't able to connect to the story; that worries me a little as well, but we'll have to see what happens when I finally read it! I completely agree. While I did like this book, I didn't like how Emma dealt with her grief. The way she treated her step dad broke my heart. She came off as very immature most of the time. It was hard to sympathize with her while wanting to slap her silly. Although I did like Emma and Caleb's relationship I did find it difficult to connect with Emma as well. The story was very emotional though. I felt bad for her and her step-dad. It is true, no one really knows what her mom would have wanted. It is such a grey area and I felt like both sides were justified in feeling how they felt. Great review. Thanks for sharing. Yep, I need to read this one and weigh in. I've heard so many different opinions!